Summary : A light, rather sweet-tasting white tea from Adagio Teas with a hint of pear. Makes for a nice bedtime tea due to lack of after-taste. Review : Drum roll please. The sample tea tin of White Pear tea I ordered from Adagio Teas was my first ever white tea tasting experience. And I can say, it was a happy one. Truth be told, I had no idea what to expect from white tea, so I approached my experience with this tea in a very open minded way. White tea, for those not familiar with it, is considered the "premium of teas" in the tea world. White tea comes from a special tea plant variety, called Narcissus. The leaves are then dried naturally in the sun. Moreover, only certain leaves can be picked off this rather rare tea plant. The leaves must have a light gray color. And finally, once picked, the leaves have to be manually sorted through to find only the best of leaves to used for the tea. Because of this, white tea tends to be more expensive than green tea, herbal teas, and all the other types of tea that is out on the market today. White tea is also known for having a rather light taste to it. And the White Pear tea from Adagio Teas is no exception. The tea has light, rather sweet flavor to it. Now, it should be noted here that this particular white tea variety has some flavor infused in it - in this case - pear. Hence the name, White Pear. Yet, don't let the name fool you. Drinking this tea is in no way like eating a pear. The pear taste just adds a touch of sweetness to this tea. And perhaps that is why I like this particular tea - it is both light, has a moderate flavor to it, and just enough sweetness to stimulate the taste buds. Additionally, while the tea leaves DO have a light pear aroma about them, the aroma is neither overpowering or strong. One of the most impressive things about this particular tea is the size and quality of the tea leaves used. The leaves are huge, to put it simply. And they get all the larger once infused. In short, you can tell that this tea does indeed contain premium tea leaves. Which is why, of course, that this particular white tea costs more than a typical green tea or flavored tea does. Adagio Teas says that this particular variety of White Tea is suggested for people who have never tried white tea before. And you know what, I agree. This particular tea will probably be liked by most people who enjoy tea. I also think this tea makes for a great "bed time" tea, as it has virtually no after-taste. So, if you have been wondering what White Tea tastes like, I would suggest ordering the sample size of this particular white tea. I think most people will find it quite enjoyable. That said, if you really like rather strong teas, you may want to steer clear of this particular tea - as the flavor and taste of it is not that strong. Recommendation : Anyone who wants to try a white tea should consider starting with this one, as the taste is rather sweet - yet light. Brewing Instructions : Use 1 teaspoon of leaves. Pour boiling water over the leaves. Let brew for 7 minutes. 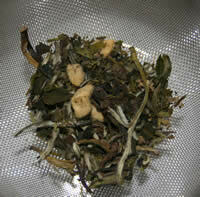 Numi White Nectar Osmanthus Spring White Tea : A long named tea that is rather short of flavor. Adagio Teas White Darjeeling Tea : An excellent and moderately sweet white tea from India. Adagio Teas White Tangerine Tea : A decent, somewhat sweet white tea that in no way had any sort of flavor of tangerine or orange. Dragonwater White Monkey Paw Tea : A very high quality, rather suble and somewhat sweet white tea that is also a green tea, too.